Review: When Hellboy (voiced by Ron Perlman), Liz Sherman (voiced by Selma Blair), and Abe Sapien (voiced by Doug Jones) are assigned to investigate a haunted mansion, they uncover a plot to resurrect a beautiful yet monstrous vampire that Professor Broom (voiced by John Hurt) battled in the past. The second animated Hellboy feature is a huge improvement over its predecessor Hellboy Animated: Sword of Storms (2006) in both story and style. I still have a slight problem with the animation, but that's just my opinion. The creatures and villains are very creepy and scary here. Hellboy and crew have there work cut out for them as they tangling with harpies, hellhounds, a werewolf, a vampire, and even the goddess Hecate herself. All are frightening, formidable, and ferocious! And they wouldn't have it any other way. Through flashbacks we see a young Professor Broom attempting to stop the vampiric countess which helps us to understand what's at stake, no pun intended, and his unwavering belief that evil must be stopped no matter what. Hellboy and his compatriots are funny and fun as always and I enjoyed their supernatural adventure. The tone of this story is much darker than the previous one, but it's much more in line with the that of the comics and the del Toro films. It was kind of like a super scary episode of Scooby-Doo, but in a good way. I'd recommend this one to Hellboy fans. It's got the goods, and Red really knows how to show the big bads that he means business. Fun Fact: After the end credits, a short self-referential teaser for the next Hellboy Animated project is played. 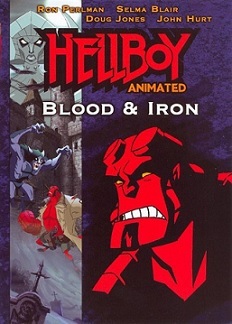 The working title for this, subsequently cancelled, third Hellboy Animated entry, was The Phantom Claw, and it was suppose to feature The Lobster, a popular spin-off character from the Hellboy comics. In the comics, The Lobster, a.k.a. Lobster Johnson, is a violent, deadly, and mysterious vigilante, who operated during the 1930s fighting gangsters, as well as supernatural threats. In the present day Hellboy timeline, the legend of The Lobster has gained popularity, and even cult status, thanks to the writings of a retired police detective, but the reading public doesn't know that his literary character is based on a real person.